What a lovely out doorsy treat you'll give with the Weekend Gardener Tote garden gift basket. With assorted flower packs and a lovely book entitled The Gardeners Year! Send your favorite gardener the Weekend Gardener Tote garden gift basket. This is a fantastic mother day gift idea. An affordable gift basket. Very vibrant. Very vivacious. And very, very pretty. Light orange roses, orange spray roses, and matsumoto asters, hot pink miniature carnations and more are delivered in a lovely glass vase. 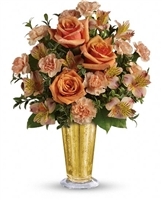 Orange roses, orange alstroemeria and orange miniature carnations are accented with assorted greens. Delivered in Teleflora's large gold julep vase. 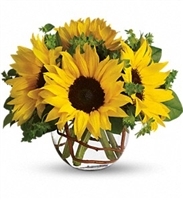 most beautiful flowers to create one-of-a-kind arrangements. 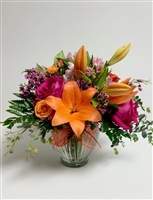 Approximately 12" W x 10"
A mix of fresh flowers such as Asiatic lilies, Viking spray chrysanthemums. 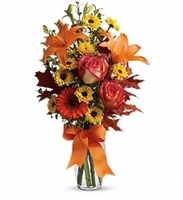 Roses and a miniature gerbera - in shades of orange and yellow - is arranged with preserved oak leaves in a clear glass vase adorned with an orange satin ribbon. 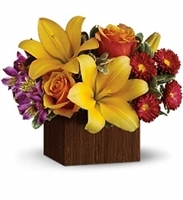 Arranged in a modern bamboo box, this stylish bouquet evokes the warm-hearted laughter of an island getaway. 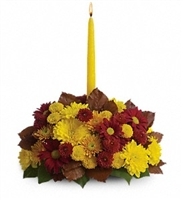 It's a cheerful choice for any occasion, from birthdays to hoorays!This chic arrangement features yellow asiatic lilies, orange roses, purple alstromeria and red matsumoto asters, accented with pretty pittosporum. 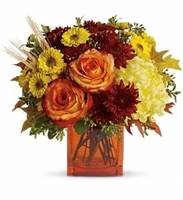 Delivered in a modern rectangular vase crafted of real bamboo. accented with assorted greenery. Delivered in an orange cube vase. 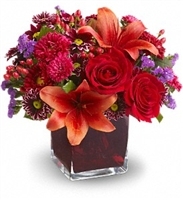 and seafoam statice are delivered in a plum glass Teleflora cube vase. ranging from burgundy and bronze to sunny yellow. Copper colored beech is a great accent.